This article is about the deaths of characters in comic books. For the personification of death in comic books, see Death (comics). 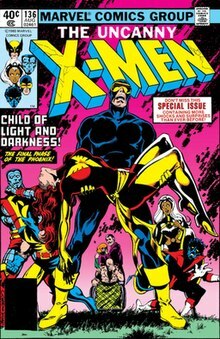 Cover to Uncanny X-Men #136 (August 1980, art by John Byrne), the penultimate issue of the "Dark Phoenix" saga. Jean Grey would sacrifice herself in the following issue, but Marvel later had the story retconned to allow Jean to appear in the new X-Factor series. Death in superhero comics is cyclical in its nature, and that's for a lot of reasons, whether they are story reasons, copyright reasons, or fan reasons. The phenomenon of comic book death is particularly common for superhero characters. Writer Danny Fingeroth suggests that the nature of superheroes requires that they be both ageless and immortal. A common expression regarding comic book death was once "The only people who stay dead in comics are Bucky, Jason Todd, and Uncle Ben," referring to the seminal importance of those characters' deaths to the title character: Captain America's sidekick (retconned dead in 1964), Batman's second Robin (dead in 1988), and Spider-Man's uncle (dead since 1962), respectively. This long-held tenet was broken in 2005, when Jason Todd returned to life as the Red Hood and Bucky was reported to have survived the accident that seemingly killed him, brought back in 2005 as the Winter Soldier, remaining in the shadows for decades. Barnes apparently died again in 2011 after a short tenure as Captain America, only to be revived by Nick Fury's Infinity Formula. Because death in comics is so often temporary, readers rarely take the death of a character seriously—when a character dies, the reader feels very little sense of loss, and simply left wondering how long it will be before they return to life. Although several comic book deaths are well-known, two of the best-known are the 1980 "death" of Jean Grey in Marvel's "Dark Phoenix Saga" and that of Superman in DC's highly publicized 1993 "Death of Superman" storyline. There is one major distinction between the two, however—whereas it was never intended that Superman's death be permanent, but rather that he would return to life at the conclusion of the story, Jean's passing was intended to be permanent, as the editor Jim Shooter felt that would be the only satisfactory outcome given that she had committed mass murder. Despite this, the story was retconned a few years later to facilitate Jean's return. In 2007, the death of Captain America made real-world headlines when he met his apparent end, but Steve Rogers returned in Captain America: Reborn in late 2009. Comic book characters themselves have made comments about the frequency of resurrections. Professor X has commented "in mutant heaven there are no pearly gates, but instead revolving doors." When Siryn was made aware of her father's death, she refused to mourn him, giddily claiming that since her father has died as an X-Man, he was likely going to be soon resurrected, shocking her friends. Her father is later restored to life but is recruited by the Apocalypse Twins as part of their new Horsemen of Apocalypse. The obituary writer of the in-universe newspaper the Daily Bugle once bemoaned to reporter Ben Urich about how many retractions he has had to write after each resurrection of a superhero or supervillain. ^ James R. Fleming, Review of Superman on the Couch: What Superheroes Really Tell Us about Ourselves and Our Society, ImageTexT: Interdisciplinary Comics Studies, vol. 2, no. 2, Winter 2006. ^ Fear Itself #7.1 (2011), Marvel Comics. ^ Brian Cronin (March 29, 2007). "Comic Book Urban Legends Revealed # 96". Comic Book Resources. ^ Ginocchio, Mark. "10 Amazing Storylines Derailed by Editorial Politics". What Culture. Retrieved 13 May 2014. ^ David, Peter (w), Olivetti, Ariel (a). "Two Meetings, One In Person, One Not", X-Factor (vol 3) #7 (July 2006). Marvel Comics. ^ Uncanny Avengers #9 (June 2013). Marvel Comics. ^ Spider-Man Unlimited vol.1 #18. Marvel Comics. This page was last edited on 27 March 2019, at 01:12 (UTC).